Florida Trail, Gold Head Branch | Florida Hikes! One of Florida’s oldest state parks, the Mike Roess Gold Head Branch State Park opened in the 1930s, its facilities built by the Civilian Conservation Corps. 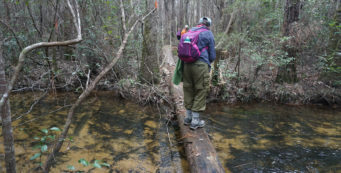 It is one of the few state parks that the Florida Trail traverses, and a pleasant place to camp thanks to its many camping options. You can rent a modern cabin with a lakeside view and all the amenities, or cozy up in a classic CCC-era stone and log cabins. 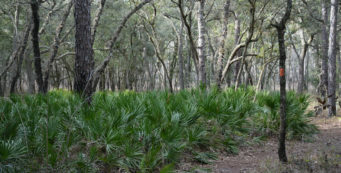 Pitch your tent among the longleaf pine in the campground, or get back to nature at the primitive campsite along a blue blazed side trail off the Florida Trail. If you’re hiking through the park on the Florida Trail, call them (904-473-4701) from the pay phone at the pavilion in the picnic area to let the rangers know you’re camping in the park, and pay your fee as you leave. 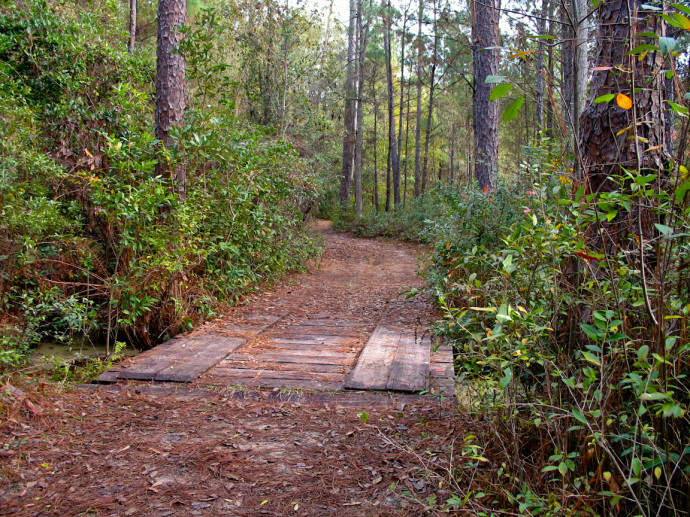 Section/thru-hikers: a paved trail runs south from the park’s front gate to Keystone Heights. Follow it 1.1 miles south to reach the Camp Blanding Gate, on the opposite side of SR 21. Follow it all the way to Keystone Heights for resupply. 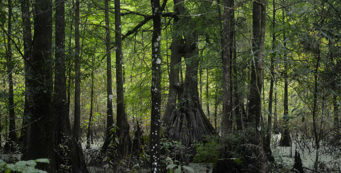 Gold Head Branch State Park is located 6 miles north of Keystone Heights on SR 21. The Florida Trail north trailhead is just inside the park gate on the left hand side of the road. The south trailhead is at the south gate, with easiest access via the parking area at the cabins along the shores of Little Lake Johnson. Start your hike at the trailhead adjoining the ranger station at the park entrance. Sign in at the register. You’ll meander through a forest of longleaf pine and turkey oak with an open understory towards the Devil’s Washbasin, also known as Deer Lake. This steep-sided sinkhole is surrounded by a sand pine forest. The trail reaches a double blaze and makes a left to follow a pre-existing road leading away from the south edge of the lake. The habitat ranges from sand pine scrub to sandhills as the trail continues to wind down towards the low spot in the terrain, a steephead ravine which is a centerpiece of the park. Gold Head Branch takes shape from the dripping of groundwater down the steep sides of this deep ravine. The Florida Trail meets the Ravine Trail at a T intersection. Take a side trip down into this fern-filled bowl by turning right to head down, down, down to the bottom of the ravine. A loop lets you explore the steephead. From the T intersection, the Florida Trail continues to the right to hug the lip of the ravine, with steep slopes downhill. You pass a bridge across Gold Head Branch at the former site of an old mill. 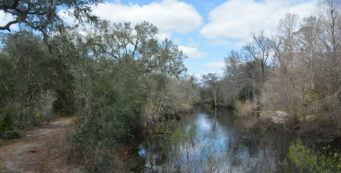 The Florida Trail continues along the Loblolly Trail, tracing the path of the burbling water below. At 2.3 miles, the Florida Trail emerges at a forest road near a bench adjoining Gold Head Branch. It’s a lovely spot to sit and enjoy the glassy water flowing past. Blue blazes lead north along the forest road to the primitive campsite. 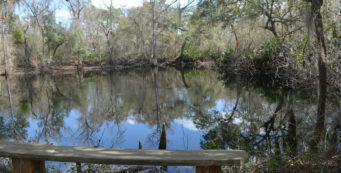 A picnic shelter offers a view of Little Lake Johnson and its marshy edge. The tent sites are under a canopy of live oaks and hickories behind the shelter, with fire rings and railroad-tie benches and a privy. Follow the orange blazes past a nature trail at a faded footprint marker up into the picnic area. You’ll pass stacks of canoes on the sandy lakeshore. The trail continues across a concrete path connecting the parking area with the beach, and passes right past the restrooms. 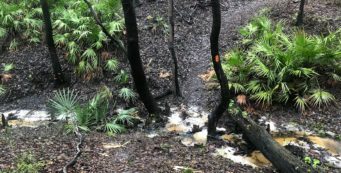 Some of the trees are down, so keep an eye on the blazes as they lead you up through a climax laurel oak forest to the park road. Cross the road and continue down the trail past CCC-era cabins to the south gate, near the maintenance shed. You’ve walked 3.5 miles. Backtrack to your car—the distance along the trail is much, much shorter than if you follow the roads around the park! The hike is a great escape from the everyday!